Super Duplex S32750 is extremely corrosion resistant and work hardenable alloys. Its microstructure consists of a mixture of ferrite and austenitic phase. It is combined with properties can mean compromise when compared to conventional austenitic and ferritic grades. In most cases, duplex SS are tougher than ferritic grades. The strength of Super Duplex S32750 pipes, sheets, and tubes are double than conventional grades. 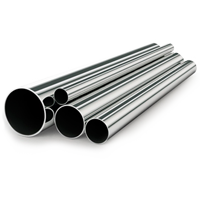 This alloy is considered resistant to stress corrosion cracking (SSC). This grade is magnetic in nature and can be used to differentiate from the common grades. These sheets, pipes, and tubes are used to carry the harsh chemicals. It is utilized in oil and gas refineries. The Super Duplex S32750 sheets are ideal for fabrication applications due to its fabricability. These have high resistance to intergranular corrosion (IGC). It performs well in chloride a sulfide containing environments. The chromium content offers protection from corrosion, grounds embrittlement at the temperature about 300 degree C. At down temperatures Super Duplex S32750 has better ductility than martensitic and ferrite grades. These grades can readily be used in lower temperatures at least 50 degree C. It has low carbon content reduce the risk of carbide precipitation around the grain boundaries while inducing in heat treatments. The alloy offers great resistance to carbide related (IGC) intergranular corrosion. Super Duplex S32750 Tubes & Sheets combines with impact and high strength good coefficient of thermal expansion and high thermal conductivity. These properties are ideal for many structural and mechanical components. These are not recommended for the environments which require long exposure up to 570 degree F temperatures, this cause lower in toughness. These grade has great weldability and do not require post weld heat treatments. This grade is processed from both hot and cold forming process. These are hot worked in the between 1875 degree F to 2250 degree F temperatures, after it is processed for solution annealing minimum 1925 degree F and rapidly quenched with water or air. The common method used in forming of SS sheets, pipes and tubes are cold forming. Alloy S32750 has higher yield strength and great ductility. These are machinable with standard machines associates with SS grade. It requires low speeds, feeds and adequate depth cut, that cuts machining costs. Specific tests are performed as per the requirement of applications. The tests are Mechanical test, hardness test, tensile test, destructive/nondestructive test, positive material test, micro and macro test, chemical test/ spectro analysis, and crushing/ buckling test. Other tests are intergranular corrosion test, flaring test, flattening test, ultrasonic test, radiographic test, pitting corrosion test and visual inspection. These are packed in Wooden boxes, crates, cartons, and cases, Spiral wound paper tubes, cores on its pallets, individual pole wrap with stretch film and delivered in form of bundles to prevent damages while exporting.